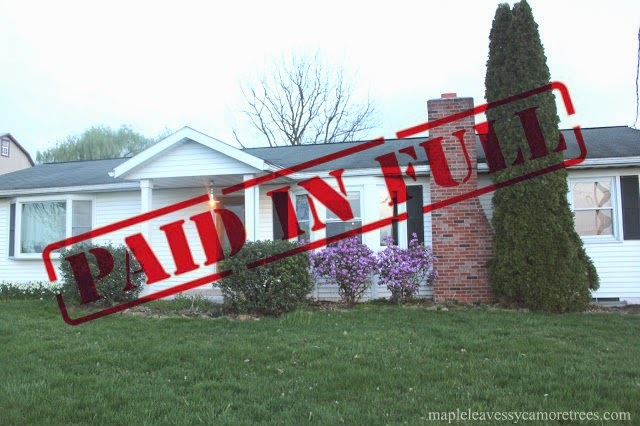 Have you ever had one of those projects that you have been planning for years? You have all the supplies and have thought it all out but the only thing missing is time and motivation. Well we probably have a ton of them but one in particular was the barnwood table that we just finished for our dining room. Seriously, I think this may have been one of the first things we planned to do when we started our renovation almost 4 years ago. My brother had inspired me when he built his own table out of barnwood several years ago. I decided that if he could do it, then I could too. He even had several old barn boards lying around that he gave to me. So anyway, the boards sat in our basement until a few weeks ago when Kat was away and the kids were in bed early. I needed something to do (probably because I was out of lives on Candy Crush) so I finally decided to start tackling this overdue project. Previously, we had bought this wooden table or at least reserved it from my parents' barn (they have a barn where they sell all kinds of crap they find or people give them to sell) probably like 3 years ago. It served as our current dining room table for quite a while now. We liked the solid legs and thought the base would look great with a barnwood top. It was much easier than trying to build my own base. So off the top went. The top was secured to the base with 14 long screws screwed through the bottom of the apron. The top was a solid piece of wood and heavier than I thought it would be. Since the new top was gonna be individual boards, I had to add some 1x4's to the inside of the base where I could easily screw through the bottom. This way no screws would have to be seen. I just used some old scraps that I had lying around. And secured four of these boards using these small elbow brackets making them flush with the top of the aprons. Next I laid 6 of the barn boards on top and mixed them around until I found the best fit. 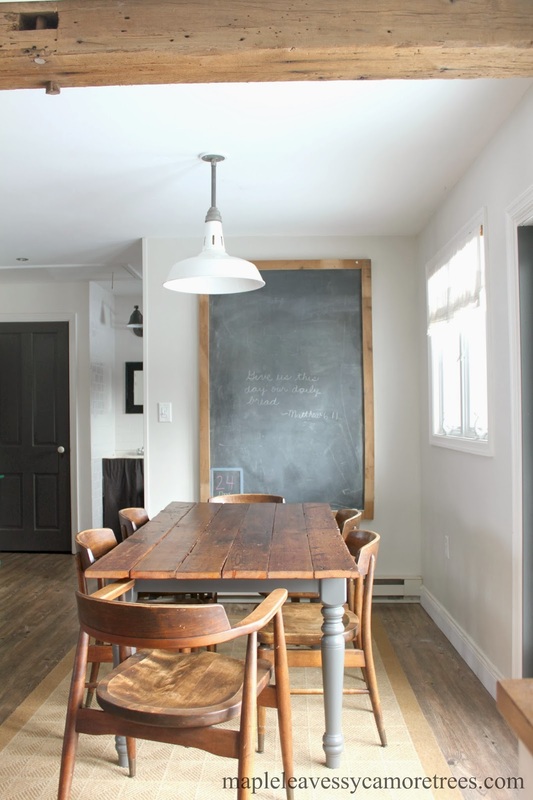 The boards were obviously not perfect and there are some slight gaps in between them at places but we figured that was all part of the rustic look. My lovely assistant helped me get the best layout before I cut each board to about 6 feet. which was a foot longer then the previous table top. Then I got two long clamps and clamped all the boards together so they wouldn't move. I measured so it was even on all sides and was now ready to screw the top in place. I put several screws through the 1x4's that I added and through the apron where the original top was secured into the barn boards. The top was now solid and secure and was ready to be sanded. I sanded it well with a belt sander as it was pretty rough and then by hand with a finer grit sandpaper. Not sure what Bryce is doing here. Oh, I guess he was trying to blow away the dust. After a really good sanding, we brought the table inside and Kat put several coats of mineral oil on the wood. 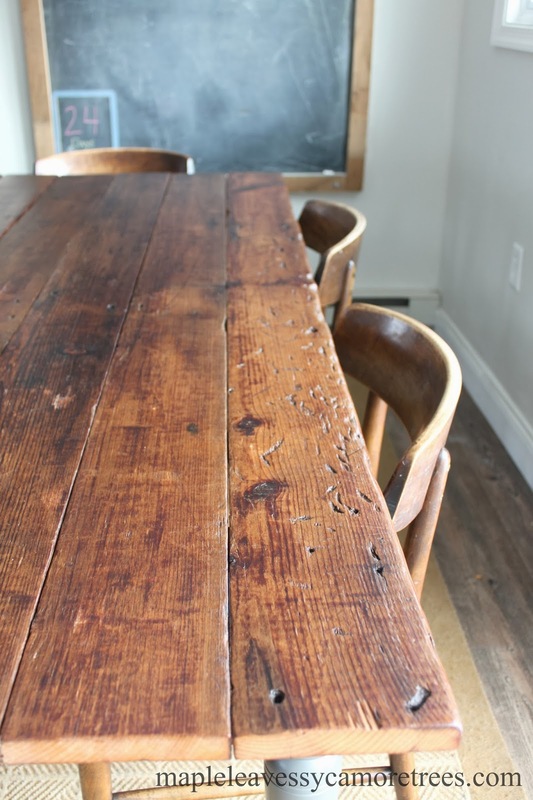 Mineral oil works great for conditioning old wood and gives it a nice rich, dark color. This served as our "stain." 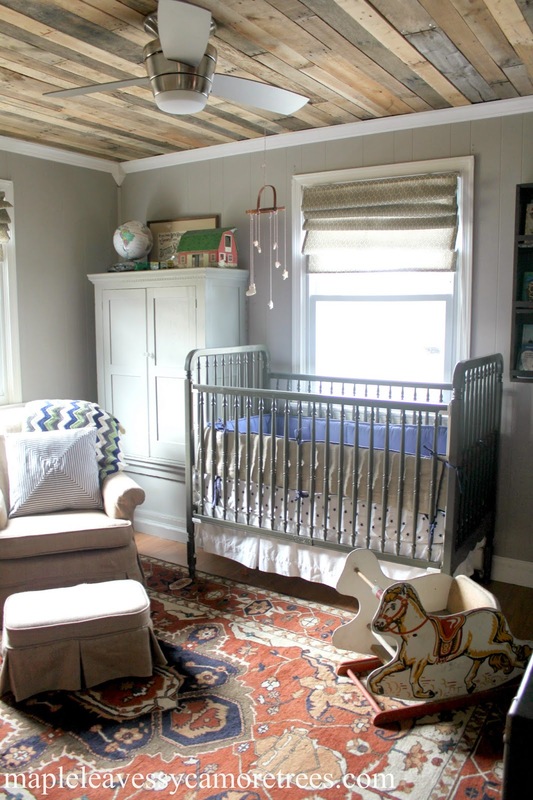 She then painted the base this grey color (Benjamin Moore Kendall Charcoal). Note: she didnt bother to prime it since she was going to protect it later with poly. And finally put a few coats of wipe-on poly on the base and wood finisher on the top. You may have noticed those whitish spots on the table. We think it was where we rubbed the table to get off some marker spots from one of the kids. Once the wood finisher dried, the spots faded away. The poly and finisher gave the table a smooth surface that can easily be cleaned. And this is how it all turned out. This is what it looks like underneath because I know you were wondering. Actually, I just realized with this picture that Kat painted the inside of the base too. She is thorough! We are very happy with the result. It adds a lot of warm, rustic charm to our dining experience. So the next time you see a request on Facebook for more lives on Candy Crush, just ignore it. Who knows, maybe it will lead to more barnwood tables. Hi Jamie, the wood finisher does seem to have a bit of a different feel than the poly but only time will tell if paper will stick to it. The can says that it is often used on wood floors so I am thinking it might be less susceptible to sticking. Hope so anyway. Yay! We love it too, Jeanna. Thanks, girl! I will give you $3 for the table and I will pick it up to help sweeten the deal. Put two or three zeros behind that and you have yourself a deal my friend. The before picture IS my table!! 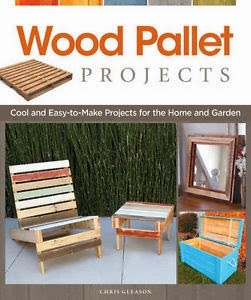 Hmm, I would definitely copy-KAT (haha) this DIY if I knew where to score some barn wood!! Do it! Hey maybe that guy whose shop you went through has some. Absolutely fantastic makeover here, Kat and Mitch. I would love to have that table in my dining room. And Kat, your styling is top-notch. Looks great! What a great idea to use an existing table and modify it. Yeeeeeeeeea! Sweat pants for liiiiiiiiiife! haha, I'm constantly in sweats when I work on projects. Mainly because I get too excited to get to work before I've taken my shower n' all that.. Awesome table! Wonderful reading about your work in the newspaper today, very inspiring. Hope to make a table like this someday. It's beautiful! 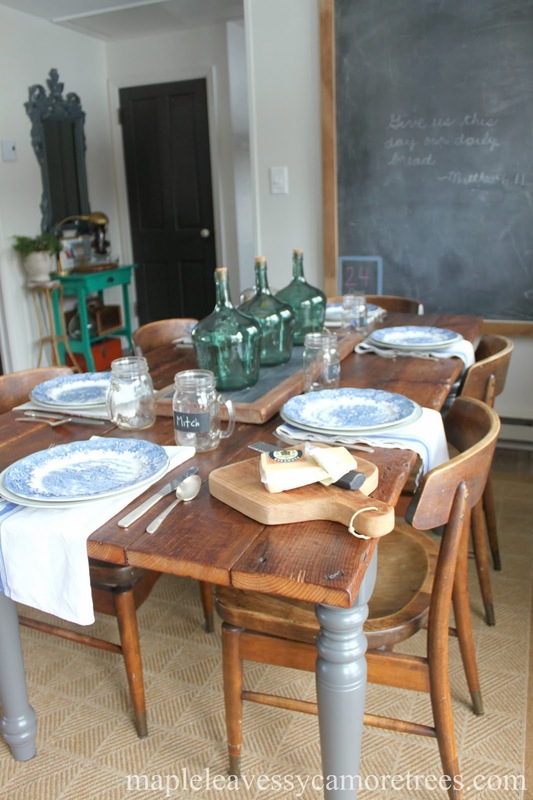 The table is beautiful, looks like it was always meant to be a barnwood table instead of a yellow wood table! this might be a silly question but did you sand the table legs and apron before painting? No, I didn't. Since I was going to apply poly after I painted it, I didn't think sanding was necessary. Love how this table turned out... that paint color with the stained wood is gorgeous! Nice work! 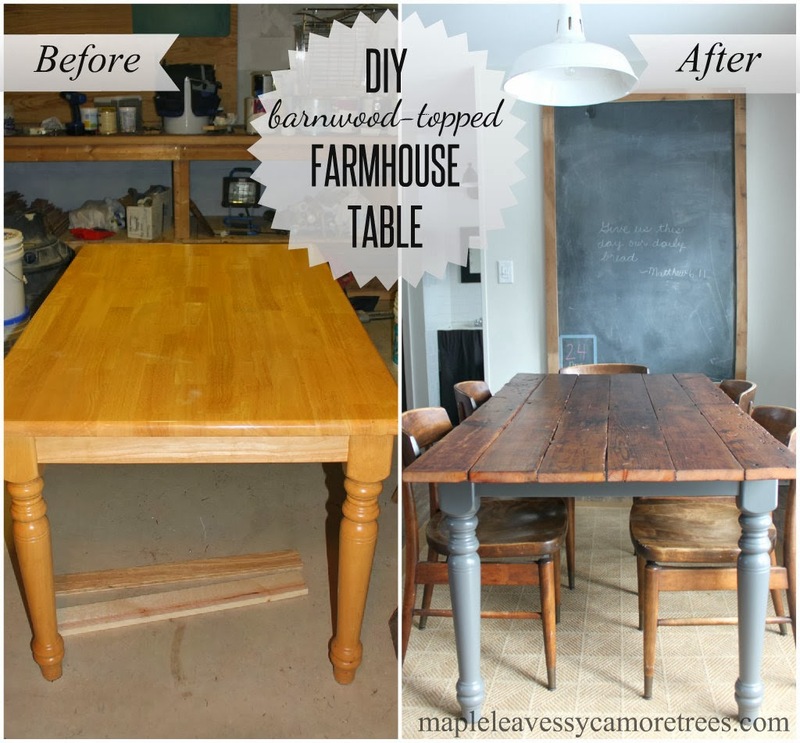 Now if I could just find the perfect table to DIY for my farmhouse! Did you use a certain brand of mineral oil? I'm sure it's all the same, but I'm asking because I don't want to accidentally use something the poly won't stick to. Thanks for share this very useful post. Painting a house is no easy endeavor, but the job can be made easier if you use the proper house painting tools. 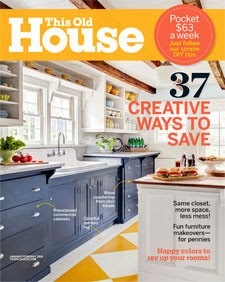 Selecting what color to paint is the easiest step in the house painting process. I found a project about how to build a dining table and liked it but I wanted to make a few adjustments to it. I needed to make it a bit larger for our dining room. My wife wanted a table that can sit 8-10 people. With a few adjustments on the length I was able to make this table 44 inches wide and made it 90 inches long. Let me just say by adding to the size it adds a lot more weight to it as well. For the table top I used 4 2x12. I trimmed each end the best I could with a hand planer and sanding before gluing. This gave me about 44 inches after words. As for the base I didn't change much other then the legs. My wife wasn't thrilled with the block like style legs so I was able to find legs in the lumber section at Lowe's that I was able to use. For the base and legs I painted them first with a greenish blue paint then on top of that I used an off white color and lightly sanded it to give that distress look. It's hard to tell from the photo but in person it really looks good. I am pleased with the way it turned out, hope this helps. To switch this belt, use this sander onto one aspect departing this wide open aspect struggling with upwards, take this release take care of plus the rollers will come somewhat jointly in order to slacken this belt. Beautiful table! One question.. if you are covering the paint with poly, you do not have to sand or prime the bottom before paint? Love the way the table look after being modified. Also, the scene of 2 boys helping their parent is really cute! I am very interested in adding new furniture that is completely unique. Thanks for sharing this informative post. Do you happen to remember what paint color that is? It's beautiful! 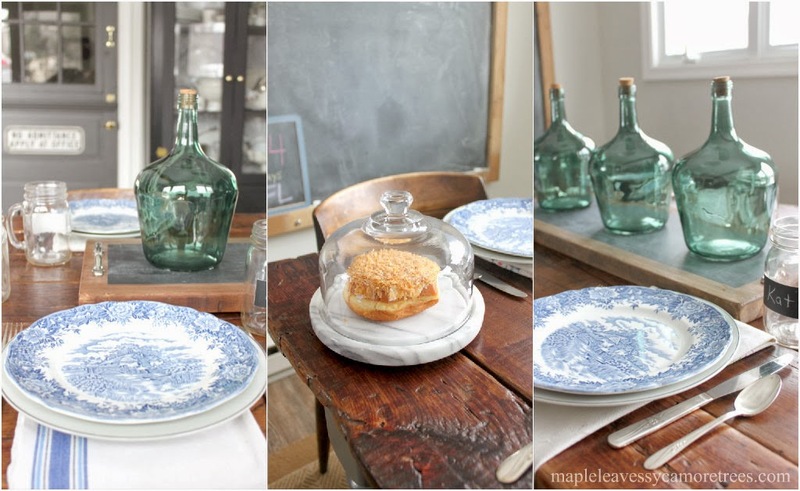 It really added a nice vintage appeal to your dining room! The table looked so smooth especially after using a sander and sandpaper to smooth the top - great job! In the contemporary world, the utilization of recovered wood tables has turned into a functional reality. Individuals purchase them since, they are eco-accommodating and in addition temperate. I must say i am really impressed with the work on the table, really cute kids there also helping you with the job, great work ! Beautiful table so glad to see a picture of you working on the finish. Just curious do you do any woodworking yourself? I'm a woodworker who happens to be female. 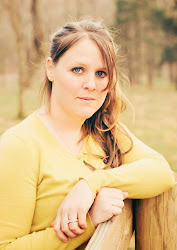 I really enjoy working on my projects and I do all of the planning, drilling, wood selection, attaching of boards etc. I don't own a table saw but I do use a miter and jig saw. I encourage you to do some of the woodworking yourself. I know you can do it. If your husband is critical, competitive,controlling and awful when you try let me know and I will chew him out for you. If he's a great guy who just likes woodworking then please disregard. Keep on going you can do anything! 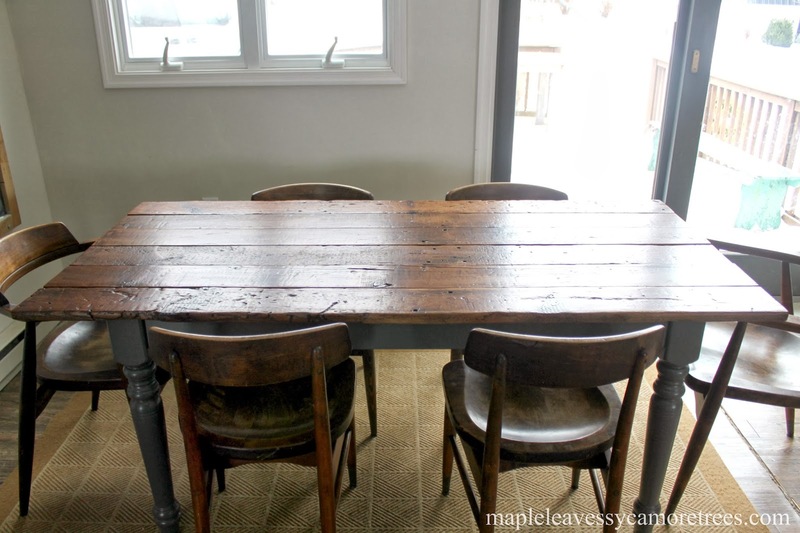 Genius idea to rework a dated table. I think I will try that. Great idea and a great end product. You both are very talented. Recovering barnwood, is a difficult activity, however the delights of knowing you are sparing a touch of history from being annihilated is a nice sentiment and can be extremely fulfilling. 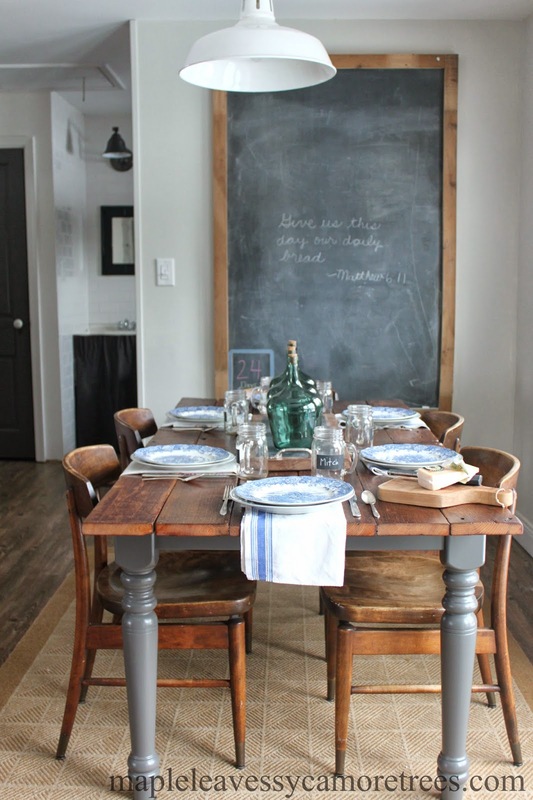 Here are a couple of thoughts on reusing old barnwood. I find a very good website for the Best palm sander , If you want you can visit this site. 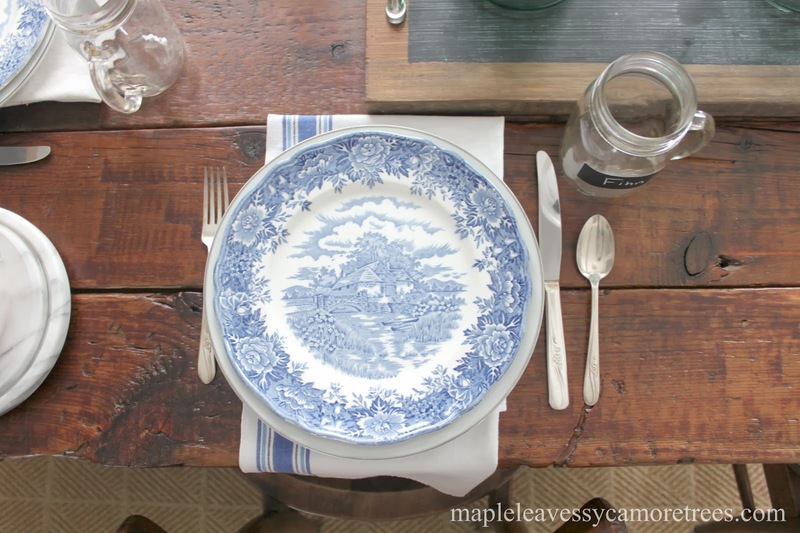 I just found your blog - what a gorgeous table! I love it. It's so special to have something handmade - beautiful!